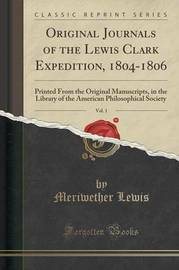 Excerpt from Original Journals of the Lewis Clark Expedition, 1804-1806, Vol. 1: Printed From the Original Manuscripts, in the Library of the American Philosophical Society The pioneers OF New France, on their part seeking a trans continental waterway from the east, had throughout the first two-thirds of the eighteenth century made several costly attempts to discover and surmount the great divide. Upon New Year's day, 1743, the Chevalier de la Verendrye, journeying overland. From his fur - trading post on the Assiniboin River, sighted the Wind River Range. Affairs moved slowly, under the French regime; but yearly the prospect was growing brighter of reaching the Pacific by way of a chain of posts across the Canadian Rockies, via the Assiniboin and Saskatchewan, when the victory of Wolfe cut short these ambitious projects, and England succeeded both to the responsibilities and the dreams Of New France. About the Publisher Forgotten Books publishes hundreds of thousands of rare and classic books. Find more at www.forgottenbooks.com This book is a reproduction of an important historical work. Forgotten Books uses state-of-the-art technology to digitally reconstruct the work, preserving the original format whilst repairing imperfections present in the aged copy. In rare cases, an imperfection in the original, such as a blemish or missing page, may be replicated in our edition. We do, however, repair the vast majority of imperfections successfully; any imperfections that remain are intentionally left to preserve the state of such historical works."